Edited by dyn5, 06 August 2015 - 11:15 AM. This sort of confirms that for each machine, the key is different. So if someone wants to disable this task, they should first check what their reg key is (the last part). I'm gonna remove the attachment for now. I updated the script version to v0.8.5 to reflect this change. Nothing in the actual text has changed (yet). - Added: Disable WiFi Sense (as suggested by pxe - Thanks!). Edge, Store and Cortana are pre-disabled in Enterprise LTSB, so cannot test tweaks regarding those. I prefer not to use them, that's why I chose to work with the LTSB version. Welcome to the wonderful world of (senseless) GUID's. Just like standards I love them GUID's, there are so many of them. You should see a nice improvement of free space on your OS drive. Since Boot-Land, I havent made a single post since move to reboot.pro, I'm going to break my silence. Have to say, THANKS. I actually used this on fresh copy of Win10 which is the free upgrade from win8.1(not sure the "edition") and most of them work, I will also note, you should stop maps sched events and disable maps update service too(which i assume comes on enterprise). Thanks again, and maybe someone (or I will) can make this into a c# program (shouldnt be hard) so you can just check boxes and click buttons to enable/disable. I actually did this already partly (the c# app) although it's a console app, I will release it whenever it's ready. Edited by StopSpazzing, 06 August 2015 - 08:52 PM. For the most part, you're right. Best protection is from outside the OS, between your PC(s) and the Internet. Unanswered question is what happens (we have no idea what we're doing) to 'Windows 10 Pro/Home' owners who try to stop updates installing? Because the Windows 10 is Service and we agreed to that by accepting the EULA. I would not be surprised if they just take off license from me at some time . Only premium ‘Windows 10 Enterprise’ users can veto updates indefinitely. I'm not that case. I have 'Windows 10 Pro' . Of course this is 'Windows 10 Enterprise' theme precisely. Good luck with turning this (huge) script into a C# app. Hopefully there'll be a nice GUI to go along with it. If you disable the windows update service, other than allowing exploitable holes in your system that would be well known from being patched increasing your likelihood of being hacked, nothing will happen. You do agree to getting updates automatically if it is on and you have no choice in that if service is enabled. There is no terms if you disable the service. About Windows Update, I see that you leave the updates fully automatic. The GUI may not notice the change immediately, even after a reboot, but in fact, if you restart the system or the wuauserv service, the changes will still be taken in account. We can also just use "net stop wuauserv" before these 2 commands. So you can just ignore the GUI. 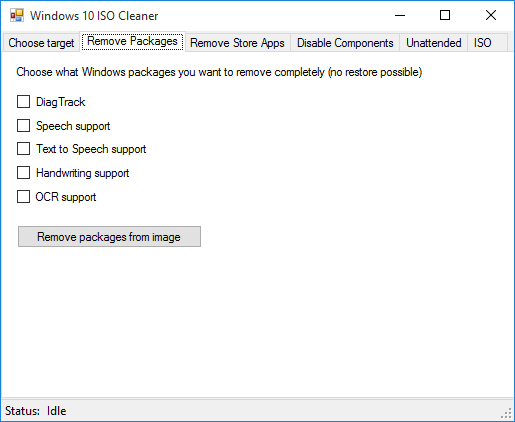 By the way, it seems that this trick can also be used on Windows 10 Pro (but I didn't checked that). - Now in PDF format. I've decided to publish the script in PDF format. I separated the sections, so it should be easier to understand. Hope you guys like it this way. PDF attached to this post. I wanted to thank you for your effort with the script. You’ve done really good job. I have been executing it line by line (not everything fits for me, but a lot of stuff did)! Probably I am forgetting something … but if it comes to my mind, I’ll be notify you. And again, great THANK YOU! Thanks for reporting the bugs. Released v0.8.9, with fixes for what Cohen reported. I haven't used the script, thou it looks very nice and interesting. Edited by franner, 07 August 2015 - 05:48 PM. You are right, it's best to use as much variables as possible. not all people have windows on C:/ for example. All variables that are set in Windows 10 can be found by typing 'set' in cmd. Guys, here is another one, it's an old one, still from Windows 7, but tested and works. It's speeds up the shutdown/restart process significantly. You can remove AutoEndTasks if you want it to be less "forced"
Edited by broodplank, 07 August 2015 - 06:55 PM. This kind of trick speeds up nothing. It just kills sooner process and services that take much time to close themselves. In some cases, this can lead to data loss. The default value for WaitToKillServiceTimeout in Windows 8/8.1 is 5000 (12000 in Windows 7). 5000 is considered by many developers as very short, so you should not go below than that. About WaitToKillAppTimeout, given the changes made in Vista for applications that need to handle the system shutdown, and the fact that this value does no longer exist by default in Vista, I doubt that this value has any effect on recent systems. It certainly does speed up the process. as it kills everything instead of waiting, indeed this can lead to data loss if shutdown is called when you haven't saved anything. but other than that it's safe. I have always used it since windows xp, and I love it. I guess opinions on this are very different. I like it fast, and I don't shutdown/restart my pc accidentally, so it fits met well. But it's indeed not recommended for average pc users. No, it's not safe at all. And you prove it yourself: if your system shutdowns sooner, it's because you kill services that were doing something. Killing a process is never safe. If you don't care about your data or the system stability, you can also just unplug the power source. In most cases, the system will restart without issue. If you are lucky (and it seems you are), it can even be the case during several years. Give it a try! It's even faster than your current method. Anyway, I assume in the tools I develop that we have at least 5 seconds. If a user wants to lose its data, it's not my problem. But I cannot let someone to say that it's safe to put these values to 1000. It's not my personal opinion, it's a fact. not working there is a possible error in "windowsc..lemetry.lib.cortana"
Ok. lol removing power from pc does actually damage the components, especially corrupts harddisk terribly over time. the method I posted is way more sane than removing power. anyways, ill just use the 5000 timeout, please don't continue the discussion on this.. You are right. just never experienced problems myself over time. 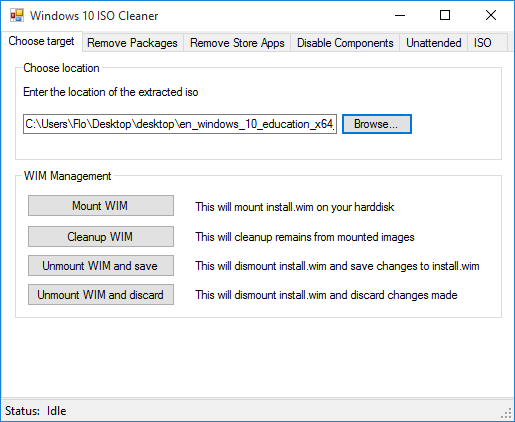 Anyways somewhat offtopic, but ok, This night I have been building a tool that allows you to clean every windows 10 iso. I have only done the first 2 tabs of the app so far. so that's all I'll show. but so far it works perfectly. Oh and yes I know there are tons of tools like these already. except so far none is really focused on Windows 10 only. Additionally I also want to implement registry tweaks, since I have found recently how to mount a reg hive from a wim I can now add this as well. Yes this is caused because it's shorten like URLS. it's critical for scripts like these. Edited by broodplank, 08 August 2015 - 06:22 AM. The .reg doesn't merge some entries due to access problems but still fixes the Renaming issue. Edited by NetworkPro, 08 August 2015 - 10:28 AM.